Mother, strategist, writer, advocate, activist. My education is in Anthropology and Philosophy. I am the Founder and Director of Democrats Work For America, a political action committee supporting grassroots organizations and initiatives. 2016 is proving to be a rough year for America. Social divisiveness is rampant fueled by a highly unusual election, episodes of police brutality, acts of violence, and political, racial and religious scapegoating. The Internet and social media have revealed a dark movement in America born out of economic struggle, frustration and social apathy. The Republican Party, after spending decades cultivating a culture of blame and general disregard for intellectualism, has given us a nominee who is acting as both champion and provocateur of this movement. Donald Trump’s poll numbers demonstrate that he is unlikely to win, but the specter he has raised is equally unlikely to go quietly and without incident. It is shocking and painful to bear witness to the sentiments many Trump supporters express at rallies and on social media. We must bear witness, however; because that is how we find our silver lining in all this mess. As we get closer to the election, Hilary Clinton’s lead over Trump is growing. As of today’s Reuters/Ipsos poll, she has a lead of 12 points among likely voters. While I find this heartening, I am still troubled by the amount of people still loyally supporting Trump. In my home state of Missouri, Clinton has a lead of only 1 point. If this were a normal election, I wouldn’t be surprised by this, in fact, I would be shocked for national polling to show such a gap. But, this is not a normal election. It is the first time we have had a female nominee. It is the first time a nominee’s spouse has been a former President. It is the first time Democrats have selected a standard-bearer since America’s first and only African-American President. It is also the first time we have had a nominee like Donald Trump, a self-proclaimed billionaire and reality-t.v. celebrity, who is a patchwork quilt of undesirable and dangerous traits. He has no political training or experience, eschews reading, advice and facts (fact checkers have given him a truth telling percentage of 4%), and touts an authoritarian and incendiary message overflowing with racism, misogyny, Islamophobia and violence-all with a 5th grade vocabulary. He speaks and “tweets” without thought, churning up controversy and invoking outrage on a regular basis. He battles narcissistic wars on the media and whomever he perceives as criticizing him, whether it be Gold Star families or fellow Republicans. On top of it all, he demonstrates very little understanding of domestic and foreign policy, let alone the Constitution. Yet, he still has a loyal following. So, what’s really going on here? We have known since the primaries that Donald Trump’s supporters are overwhelmingly white males without a college degree. Early theories of his popularity among this group centered around the idea that they are economically disenfranchised by technology and a global economy, and that Trump appeals to them with his nationalistic approach to trade and immigration. In August, however, Gallup released a large research study that pulled that theory into question. The findings of the study demonstrated that while Trump supporters are, in fact, mostly white, blue collar males, they are not economically distressed. They do, however, live in communities that have seen influxes of immigrants and express that they feel a loss in social status and a fear that their children will not enjoy the same upward mobility that they did. The latter fear, I would posit, is a common concern among many Americans and should definitely be at the center of the national conversation. It is a complex issue that encompasses many socioeconomic issues in addition to the affects of technology and a global workforce, such as social security, the aging of the Baby Boomers, and healthcare to name a few. The first two commonalities that Gallup reported are of more interest in understanding Trump’s following as they have to do with two issues: diversity and blame. As I mentioned earlier, the Republican Party has purposely cultivated a culture of blame and suspicion–even worse, blame and suspicion that is not rooted in fact. They have allowed the alt-Right entertainment media to act as the voice of the party for many years. The prolific and popular Fox News openly blurs the lines between entertainment and journalism, and Republican politicians have exploited that market to manipulate their constituencies–a practice they are most likely regretting now that Trump has gone so far as to place the head of Breitbart, Stephen Bannon as his campaign leader. The Internet is littered with alt-Right media outlets that have the journalistic integrity of The National Inquirer, running articles filled with conspiracy theories and the barely veiled bigotry of white-identity politics. Since they have irresponsibly allowed–even supported–narratives outside of the pragmatic rules of logic and discourse, the Republican Party has created the nearly impenetrable “echo-chamber” of Trump supporters on social media. The many Republican politicians who fear Trump is an unqualified standard-bearer and would be a dangerous President are in a quandary as they have nurtured the ideal Republican voter to be non-thinking and reactionary. As many Americans have made strides to embrace and celebrate diversity and multiculturalism, actively working on equal rights and opportunities for all, it must be understood that as human beings we have an innate distrust for the “other”–that is, anyone who has physical or sociocultural differences from us. It is up to us as a thinking and social people to overcome that tendency. If a community is experiencing worry, anxiety or fear, as many are now, due to economic difficulty and stagnation, terrorism and acts of violence, they will look for some “other” to blame. For the white male, there are plenty of “others” to blame. They see the differences in faces of their community–racial differences, religious differences, sexual-orientation differences, gender differences–and they blame those who are different for personal and social problems. Instead of working to solve the many problems we face in a progressive and thoughtful manner, some are choosing to slide down that slippery-slope of national recidivism–quite frankly, they would prefer not all people had equal rights and opportunities in America. Trump’s slogan, “Make America Great Again,” begs the question: When was America great? Remember, that every step backward is at the exclusion of the rights and opportunities of one or more of the many identities represented by the American people. To disregard the life, liberty and pursuit of happiness of another group of Americans is an expression of social apathy, or, outright hate. Sadly, both sentiments are highly contagious and are spread rampantly through unintelligent and, often, vulgar social media posts. If we look at the factors in the Trump movement as including the response to diversity, the propensity to blame, social apathy, and a disregard for factually-informed thinking, we must also include the obvious: misogyny. There are some that openly admit that they don’t think a woman should be President, but there are many that simply make their opinion known by consistently engaging in false equivalency. The definition of false equivalence is “a logical fallacy which describes a situation where there is a logical and apparent equivalence, but when in fact there is none. This fallacy is categorized as a fallacy of inconsistency.” The criticisms that the Trump campaign and Trump supporters offer about Hilary Clinton are positively embedded with double standards. Unfortunately, this is not a new phenomenon for women, but, much like systemic racism, one people are loathe to admit. An example is criticizing Clinton as a liar, when we all know Trump’s acquaintance with the truth is nominal. Other examples include describing her as unqualified, crooked, self-interested–the bar is set so low with Trump that criticisms like these seem bizarre. It is my hope, that by the end of this election, more people will have snapped out of the trance that is drawing them to Trump, but the silver lining in all this divisiveness is that we know the steps that we need to work on as a country. The Republican Party will have to work hard to rectify the damage it has done to itself and its people. Critical thinking skills should be learned before college. Systemic racism and misogyny must be addressed. We must promote a culture of solutions, not blame. Most of all we need to look forward and resist the urge to believe that a better time existed before–because, it most certainly was not a better time for all Americans. That should always be our goal. Republican nominee, Donald Trump, is blaming “The Media” for his falling poll numbers, and working his followers up into yet another poorly thought out lather. Though Trump’s battle cries are about media bias and dishonest reporting, I suspect he is truly upset because he thought he was in control of the press–using them to his own benefit. He thought he had a firm understanding of how to play a game. When he transitioned from the primaries to the general election, though, the game changed, because the players changed. Trump’s shenanigans were now being focused on by the rest of America–judged, as they should be, in the harsh light of a serious Presidential election. 1). A general election is a lot more serious than a primary. Trump did not enter into the general election with his game-face on, or implement any changes to his approach. He continued to deliver the same demagoguery, supporting his claims with hearsay and falsehoods. He continued with his “tell-it-like-it is” approach, littering his campaign with racism, sexism, and antagonism, behaving in an absolutely un-Presidential manner. 2). His audience changed. He was no longer only targeting a section of the Republican voting base. The fact that he needed to alter his style to appeal to a much larger voting base seemed to allude him. This is not just a matter of modifying his approach to connect with moderates and progressives, but to win the respect of educated people. Once he was on stage as a Presidential candidate, the bombastic buffoonery needed to stop. Yet, his campaign has been fraught with overtly controversial statements and genuinely ignorant pratfalls. When the press covers these situations, the “any press is good press” theory no longer applies to his new audience of potential voters. “We believe that Donald Trump’s divisiveness, recklessness, incompetence, and record-breaking unpopularity risk turning this election into a Democratic landslide, and only the immediate shift of all available RNC resources to vulnerable Senate and House races will prevent the GOP from drowning with a Trump-emblazoned anchor around its neck,” the letter says. Donald Trump is not being treated unfairly by “The Media.” He’s been playing a game for attention, it’s just a game he’s now losing. And like a petulant child, he wants to accuse the other players of cheating. I, for one, am waiting to see if he chucks the game board and goes home. In its simplest form, modern Republican conservatism was traditionally about less federal involvement in the states and corporations, and minimizing government spending (small government vs big government). During the Reagan era, Republicans embraced the idea of trickle-down economics and solidified themselves into protectors of the extremely wealthy, simultaneously supporting decreases in government spending on government subsidized facilities such as mental health hospitals, orphanages, etc. to offset the tax cuts Reagan gave to stimulate the economy. Reagonomics was a rocky road–while many people improved financially, the rich got richer and many, many Americans became disenfranchised due to a loss of government facilities and support. Further, the federal deficit grew from the billions to the trillions. Republican politicians new they would need more than the wealthy vote to maintain power, so they bolstered efforts to cultivate a larger voting base. They did this in two ways: anti-intellectualism and embracing “conservative values”. This is where the slippery slope begins, folks. They linked intellectualism to liberalism. They charged the media with being inherently biased (as intellectual liberals). They used vitriol and vehemence to emotionally appeal to white, evangelical Christians, not caring that they had no plan or process to back up their positions. They preyed on the uneducated, knowing they wouldn’t ask the right questions. Out of this, they gave birth to the Religious Right–a mixed bag of wealth, fundamentalism, bigotry and, above all else, an abhorrence toward critical thinking. They have nurtured a culture of blame. Blame immigrants, foreign countries, gays, blacks, Muslims, liberals–anyone different from yourself. Blame the President, but don’t look behind the curtain at the Republican controlled Congress that grid-locked the entire system. Perhaps, worst of all, they have preyed on those who have suffered from the recessions and the shifting economic landscape. They stir them up promising them they will bring their jobs back without truly talking about the realities of globalization and technological advancement–that it is here to stay and that we, as a people, must adapt and retool to find our place in this new world. Instead they encourage outrage, entitlement, and the lamentation of change without looking to viable solutions. They have floated obviously unintelligent people to champion their message such as Dan Quayle, George W. Bush and Sarah Palin and, now, Donald Trump. Perhaps, they did not think he would win the primary. Perhaps they thought they would be able to control him. Most likely, they just underestimated the chaos they had nurtured in their Republican constituency. Through their efforts to lock in the adulation of the uneducated and moralistic right wingers, they had unwittingly set the stage for Trump and opened Pandora’s box, out of which is climbing the absolute worst representations of the American people, including white supremacists and neo-Nazis, who insist that Trump’s people are their people. They believe that Trump’s popularity is a signal that the American people are primed to embrace their hate-filled beliefs. Trump is the poster boy for authoritative speech without knowledge. Trump engages in vitriolic stump speeches devoid of of truth, evidence or intelligence, and, his followers rabidly sing his praises. From his first day in the primary, he has fearmongered, stirring up the people into a frenzy of isolationism, bigotry, misogyny and divisiveness. As his speeches, interviews and tweets become increasingly absurd-even dangerous, Republican leaders scramble to distance themselves from him, terrified that they will be forever branded by his persona. Other Republicans are terrified not to support him because they fear losing their own down ticket races. The entire party is careening out of control because they essentially chummed the waters and then let loose a dangerously unqualified and irresponsible candidate. The strategy they used to secure a consistent voting base backfired “Big League” because anti-intellectualism is actually a tenant of facism. Further, fascist regimes rise to power through propaganda, emotional/moralistic appeal, and instilling in their followers that they must protect against progressive change at all costs. Facists wield and exploit paranoia as a tool against potential detractors such as the media and academia. The Republican leaders of the past few decades would have perhaps avoided this catastrophic situation if they had been better educated in political and social philosophy. So, what can be done now? I am not a Republican, but I believe bi-partisanship is a necessary apparatus to our political system. I think they must fully denounce Donald Trump and make it clear to their constituents exactly why he is not their standard-bearer. They need to accept their losses, own their mistakes, and reform the party. They need to drastically pivot their path away from this trajectory that has set the stage for fascist ideologies to take hold. 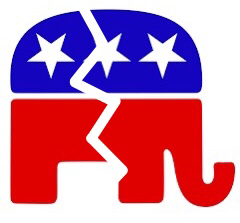 The Republican Party may have imploded, but it is their responsibility to make sure America is not destroyed along with it. Technology has advanced at a rate faster than society can adapt. Though there have been outstanding benefits, we are struggling to compensate in terms of our domestic economy and labor force, security, and our role in the global arena. Technology also ushered us quickly into the Information Age, drastically changing the way we learn and communicate. The Internet has been a game-changer in many, many ways. Answers can be found in seconds, information can be immediately shared with millions of people, communities can be formed outside of the constraints of time and location. Likewise, opinion can be masqueraded as fact, false research can be presented as legitimate, and what you share publicly can potentially affect millions. While the Internet isn’t exactly new, online communication is becoming increasingly powerful due to constant access to the Internet via cell phone and the ever-growing popularity of social media. With the rise of social media we also saw the rise of the meme. Dictionary.com defines a meme as “a cultural item in the form of an image, video, phrase, etc., that is spread via the Internet and often altered in a creative or humorous way.” It’s true that the vast number of memes we have seen in social media (e.g. Facebook, Twitter, Instagram, Snapchat) have been innocent enough representations of humor, inspiration, and, well, cuteness. As it is an election year, however, heated social issues have arisen in our public consciousness, and our collective social media presence reflects that. The formerly innocuous meme has been repurposed as propaganda in the sociopolitical landscape. When propaganda is shared and presented as fact it becomes a dangerous tool. There is only one defense against such an onslaught–critical thinking. Critical thinking is defined as “disciplined thinking that is clear, rational, open-minded, and informed by evidence.” What does that mean, exactly? At it’s most basic, it means that you apply the same rules of logic to any concept or statement, without pre-judgement (emotional or otherwise), and you require high standards of evidence. Baby Boomers and Gen Xers are particularly vulnerable to propoganda on social media because critical thinking was not taught in the K-12 public school system, although it is generally a required class in college. Thankfully, the public school system is now working to incorporate critical thinking skills into the curriculum. Another disadvantage for those of us who grew up pre-Internet is that we received limited education on how to evaluate source material (we had no where near as many sources available) and no education on how to evaluate online source material. Despite this, we must adapt to the fact that the Information Age is also the Misinformation Age, and that the burden of proof will have to fall on the shoulders of the individual. When it comes to learning and sharing information online, there are two issues that have to be resolved within each person. First, what is the validity of the sources one is using to inform their own positions, and, second, is it socially responsible to share unsubstantiated information or information from an invalid source as if it is true? The temptation for many people is to actively seek out websites, blogs and online communities that reaffirm their own beliefs, no matter if they are sources of legitimate information or not. When you then take that illegitamite information and share it publicly in the form of a meme or written post you are, in fact, spreading propaganda. Then other people become informed by the same illegitimate information–and so it goes on and on. People then take that information into their daily conversations and use it to shape their decisions. Don’t we have freedom of speech? Of course we do…which is all the more reason to be discerning about your sources. I would also argue that we have a social responsibility not to engage in the spread of propaganda–especially on issues that affect our society at large. So what should you do? When you read something on the internet, consider the source. If it’s opinion, recognize it as such and subject it to the rigors of critical thought. If it is presented as factual, look at the source site. Is it a legitimate news site? Is the content extreme? Is it covered in advertising? Are there references? Take a minute to validate the information even if it is supportive of your beliefs. Likewise, when you see a political meme in your social media feed, do not just promptly hit the share button. Once again, consider the source it came from, do a quick Internet search to verify the content…and most of all, think critically about the content. Only share if it is valid. Remember, we will only solve our social problems if we can engage in meaningful discourse. Without critical thinking, that is not possible. It’s obvious that I find this election extremely important, and my political leanings are just as obvious. I would like to take a moment, however, to express just what is driving me to keep focused on the political conversation. As the mother of two children, 9 and 8, I have two responsibilities: 1) to teach them the best possible values and skills to be good human beings, and 2) to do everything I can to ensure that they have a good future. I want them to see that hard work, perseverance, and education are the way to make changes in this world–that critical thinking and compassion are absolutely necessary to any conversation–that sensationalism and ignorance may be entertaining, but is not effective–that to better your situation, you must be pro-active and courageous, not reactionary and fearful. I also want to teach them to love, not hate, and that indifference is just as dangerous as hate. People tend to only care about social issues when it directly affects them, but here’s the deal–we don’t know who are children and grandchildren will become and what their needs and issues will be. I have two smart, funny, compassionate, quirky kids. My son has autism and we are grateful for the assistance through the school system that he is provided, but what of the rest of their journey? They may or may not go to college. They may struggle with debt. They may choose a professional path, skilled or non-skilled trade or the arts. They may be police or join the military. They may identify as LGBTQ. They may change their faith, they may fall in love with someone of a different culture or ethnicity. They may have biracial children. They may struggle with mental illness or addiction. They may experience poverty, homelessness or prison. I cannot control their journey, but I can ensure that they experience that journey with the support, justice and liberty promised by our country. I cannot afford to be indifferent about politics and social issues. Can you?